Pink and gold, combined, are a supreme force. 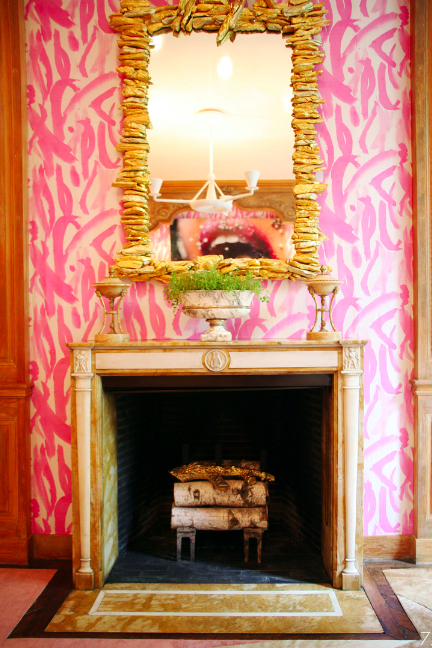 And executed on this fireplace at the Kips Bay Showhouse by Amanda Nisbet is a prime example of said power. I don't decorate enough with pink. Have a wonderful weekend - hope you relax and/or get a lot done. See you Monday! It was a gorgeous room. The woodwork had to be saved and the pink and white silk was pinned up over existing wallpaper. You can see a few more pics of the room on my blog post on kips bay from pics I took last weekend. I think you'll love it!